This mean that popups could lock the browser until users reacted to the popup in question. While that may be useful in certain situations, it often meant that sites used these options to lock the browser and force users to interact with the popup. This ranged from prank sites that put you in an endless loop of popups to attack sites that asked users to pay up to remove the popup and return the browser to its default state. Doing so dismisses the popup right away. Users don’t have to interact with the popup directly anymore, or even force kill the Chrome process to regain control over the web browser. If a tab is the foremost tab, then we would present the dialog for the tab. alert/confirm/prompt dialogs would then be displayed and focused for user interactions. If the user interacts with them and performs the user interaction they are designed for, then nothing notable would happen. 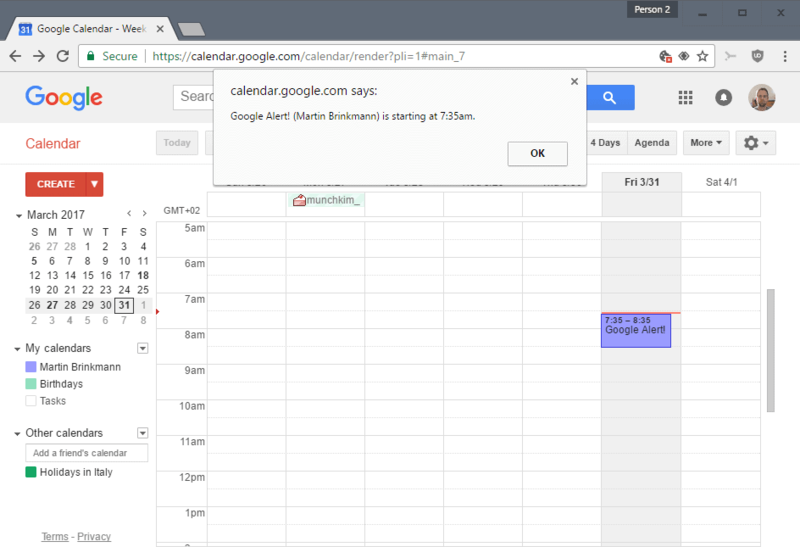 Does this mean that Google will change Google Calendar’s use of alert() for notifications? Only time will tell. If you look at other browsers, you will notice that they have implemented the functionality years ago. Both Firefox and Opera have had this option implemented for years. This entry was posted on Friday, March 31st, 2017 at 10:39 am	and is filed under General News, security. You can follow any responses to this entry through the RSS 2.0 feed. Both comments and pings are currently closed.